On July 26, Russia marks Navy Day, an annual celebration in honor of the country’s fleet. To mark the occasion, RBTH correspondent Oleg Kuleshov ventured inside the largest submarine in the world, an Akula-class vessel, where he found out more about the conditions on board – as well as the initiation rites servicemen undergo to become a real submariner. 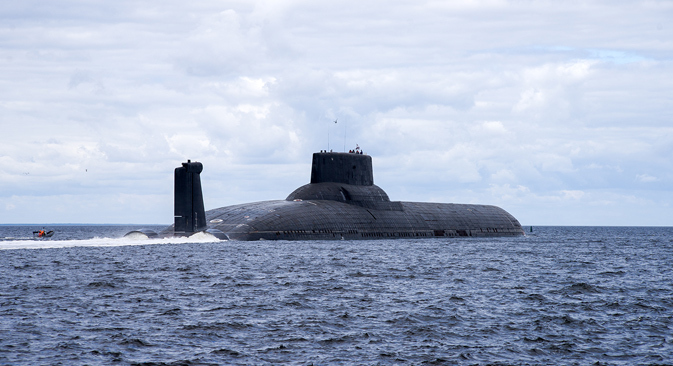 At the end of June the Dmitry Donskoi nuclear submarine left Severodvinsk, the principal base of the Northern Fleet. It entered the White Sea on a mission, one objective of which is to interact with Russia's antisubmarine forces. This is a unique vessel. The submarines of this series (Project 941, or Typhoon, according to NATO's classification) are considered the biggest in the world. Their length of 124 meters is comparable to two football fields, while the height of this naval predator is that of a nine-story building. All six Akula submarines (the name means “shark” in English) have been included in the Guinness Book of World Records. The impressive dimensions of the vessel were necessary in order for it to be equipped with non-standard sized ballistic missiles, which normal submarines were unable to carry. As of today the Russian fleet has three of the six originally constructed Akula subs: the TK-17 Arkhangelsk, the TK-20 Severstal and the TK-208 Dmitry Donskoi, which, thanks to modernization work carried out from 1996 to 2002, is the most contemporary modification of the Akula. Modernization consisted of converting the nuclear-powered vessel to a towing submarine for experiments with the new Bulava ballistic missile, which was developed for the Project 955 Borei strategic missile carriers in the absence of launch apparatus from which experimental missiles could be fired. Despite the fact that experiments with the Bulava missile are now complete, the Dmitry Donskoi is continuing its service in the 18th submarine division of the Northern Fleet, based at the White Sea city of Severodvinsk. The vessel's crew constantly carries out tests at sea and the submarine is currently being prepared for meeting military objectives in the open sea. The missile carrier is equipped with emergency surfacing chambers that are designed to rescue the entire crew in case of disaster. The light body is covered with a sound-absorbent rubber material, whose total weight is 800 tons. This special covering, which helps the submarine to avoid being detected, gives the vessel the appearance of a gigantic rubber toy. From the conning tower we descend along a ramp into the submarine and enter its main command center. It is here that all the vessel's systems are controlled: the helms, missiles and radio-technical weapons. In essence this is the submarine's brain. The submariner initiation ritual also takes place here. The submariner initiation ceremony is performed for everyone who is about to submerge, regardless of rank or position. While underwater, the sailor must drink a flacon of seawater. Then he must kiss a swinging sledgehammer, which on the Akula is a club ("bulava" in Russian), a reference to the homonymous missiles that were tested on the vessel. The most important thing in this procedure is not to be hit on the teeth. Whoever performs the ritual successfully receives a submariner certificate and, depending on the crew's mood, a present in the form of a roach, and sometimes even a "commemorative stamp" on his derrière. Inside there is a rest area that includes a bath, a pool, a solarium, a gym and a relaxation room with a winter garden. The exercise equipment to the left was developed by a leading nuclear submarine designer, the Rubin Design Bureau, while the one on the right was donated by patron organizations. The pool measures 4 x 2 meters and is two meters deep. It can be filled with fresh water as well as seawater and can be heated. Submariners regularly visit the sauna, but more frequently the bath. At sea the service schedule is always tight – there is no time. A few years ago the Akula even boasted a little zoo – there were parrots and canaries aboard. However, the birds could not tolerate the submersion and now the submarine only has a winter garden. The Dmitry Donskoi contains two mess rooms. The first is for the younger crew and the second is for the officers, which also has an exhibition dedicated to the Battle of Kulikovo (the great victory won against the Mongols in 1380 by Dmitry Donskoi, after whom the vessel is named). It is in the second cabin that the submariner initiation with the club takes place. All the furniture in the mess room and in other rooms is fixed to the floor with chains in order to prevent it from rocking. We were called to visit the commander's saloon. It has three rooms: one for meetings, the commander's cabin and one for the senior officer on board. Unfortunately, it was impossible to see other areas on board the Dmitry Donskoi. Despite its respectable age, much about this gigantic submarine remains a secret and access to many areas is reserved only for military personnel. According to the plans of the Russian Fleet, the submarine will remain in use until 2022, though it is possible that it will then be modernized and continue its service.